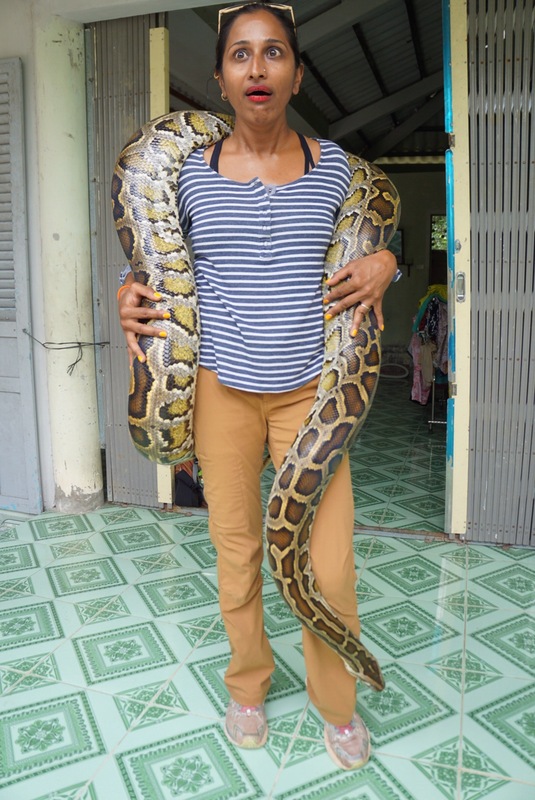 In which I get felt up by a python and have a day I’d rather forget in Saigon. We loved Ho Chi Minh City, or as the locals still call it, Saigon. ﻿. As before, I’m glad when we decide to spend more time in one place instead of bouncing around every few days. We came in on a Friday and had a flight to Tokyo the following Friday. On Tuesday, though, we went near a bookshop and they had all sorts of Totoro merchandise. As we were excitedly looking through it, a little spark went off in the back of my brain. “Self,” I thought to myself, ” do you vaguely remember how you moved your plane tickets to Tokyo back by a few days because of when you’re going to the Totoro/Studio Ghibli museum?” And I replied “Why, yes, now that you mention it I do remember something of the sort. But I wouldn’t have completely forgotten when I’d booked a plane ticket by two days, would I?” At which point I retorted “Have you met yourself? You’re the same person who once spent an hour looking for eyeglasses SHE WAS WEARING AT THE TIME.” Oh yeah. See? This is why I like talking to myself. Endless support! A call to Japan Airlines confirmed that we were indeed booked on the flight the next day and not Friday. I had a small panic attack over this, and needed to call two overseas JAL offices to figure out a solution. Thank goodness for internet calling capability. Out of sheer luck, we were able to move the ticket to Thursday at no additional cost and change our Air BnB reservation as well, but man, those were some anxious hours. 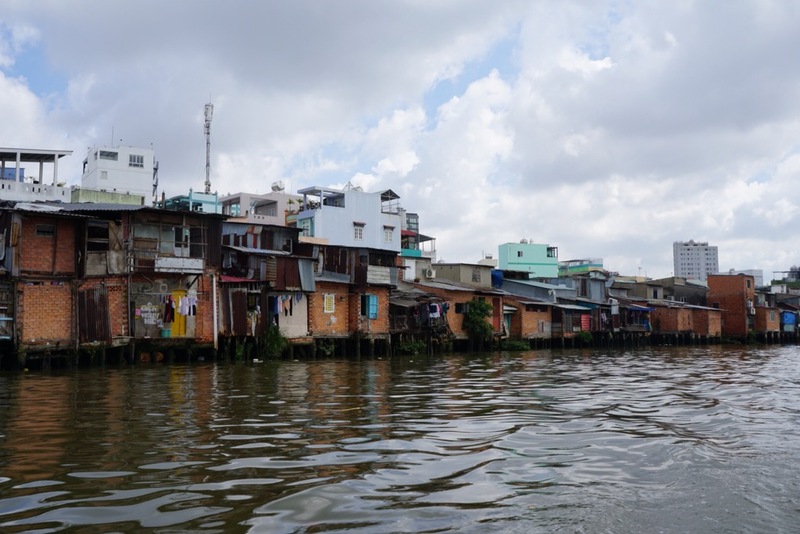 We awoke on Wednesday to take a boat tour of the Mekong Delta. I’ll say here that this wasn’t really my cup of tea. I’ve written before about how I dislike bus tours where you walk through areas like you’re in a human zoo, and this was sort of the same but on a boat. It was a small tour and the reviews were excellent, so we thought we were in for a treat, but we weren’t impresed. The kids felt the same way, especially after some of the really small scale experiences we’ve had. Still, there were some interesting tidbits to be had and some great pictures that I’ll share here. We started off by heading through the slums of Saigon. Remember how I talked about not wanting to be those people heading through the slums in a bus, disembarking and taking pictures? Well, we became those people in a boat. Sigh. 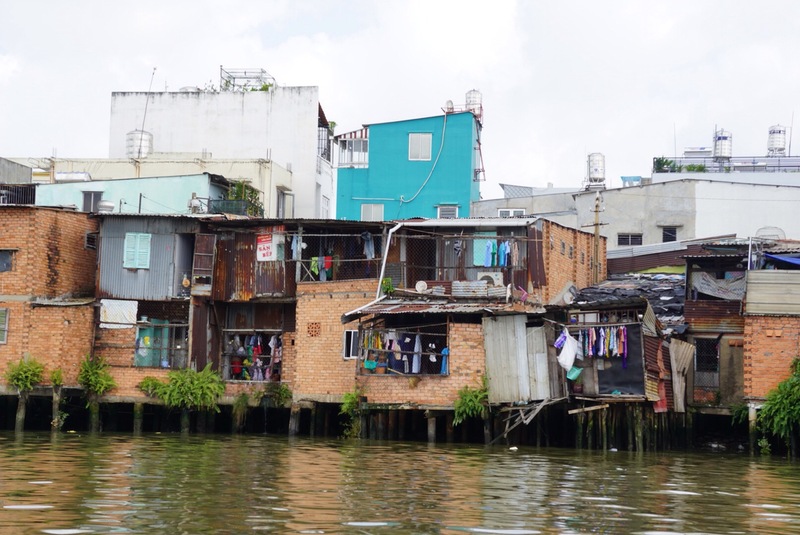 These houses border the river around Saigon. Our guide told us that the government is trying to move them but doesn’t really provide enough for them to afford even a small apartment on the city outskirts. Moving to the country isn’t an option because of a lack of jobs and opportunities for their children so here they stay. The front of the houses face a busy street and often have a shopfront, so it’s not even clear that the back faces the river. 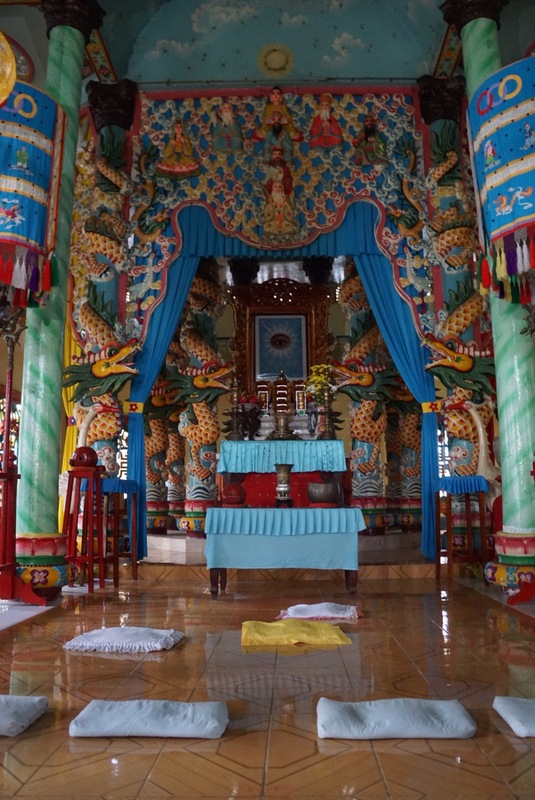 Next stops were a buddhist temple and then a look at a small village along the Mekong Delta. 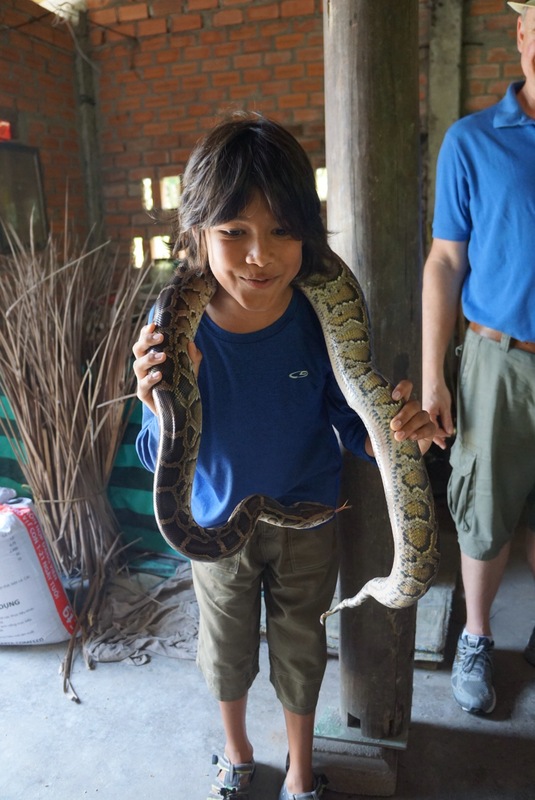 We met a family who raises pythons to sell for meat and skin and had some close encounters with them! The little 90 year old grandma who lives there let me take some pictures of her. 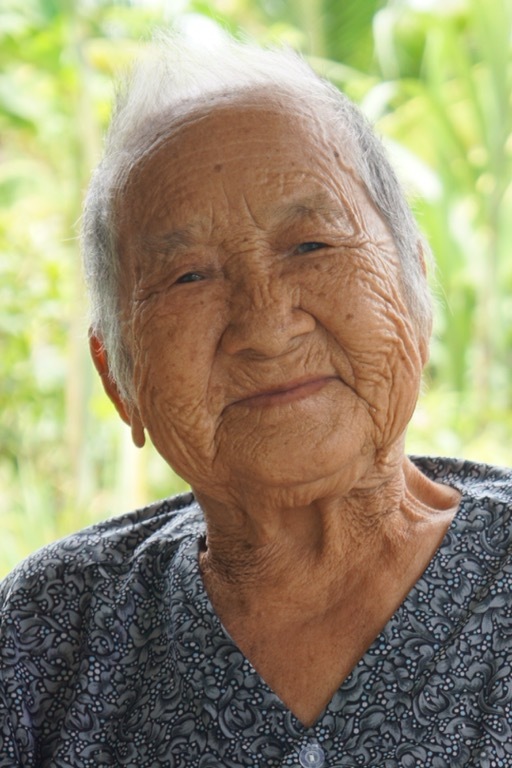 I love pictures of the elderly – so many stories in the lines in their faces. The tour took us by an orphanage that was run by Buddhist monks as well. I don’t know how I feel about this – it was different than I was expecting, with children growing up clearly well fed and receiving an education in a clean environment, but overall it felt weird to me to have this be a stop on a tourist tour. I didn’t take any pictures therebecause it just felt odd. 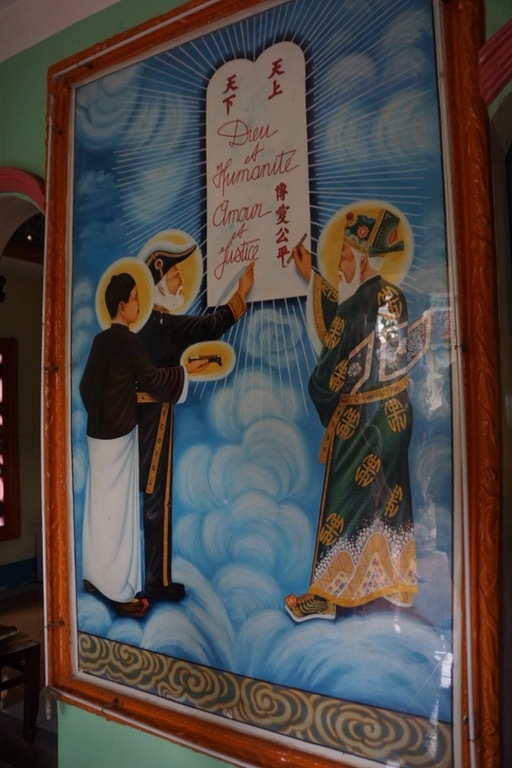 In the village was the Cao Dai temple, which has as its holy people the Buddha, Confucius, Sun Yat Sen, and…Victor Hugo. Yes, even the Vietnamese appreciate the French Revolution. 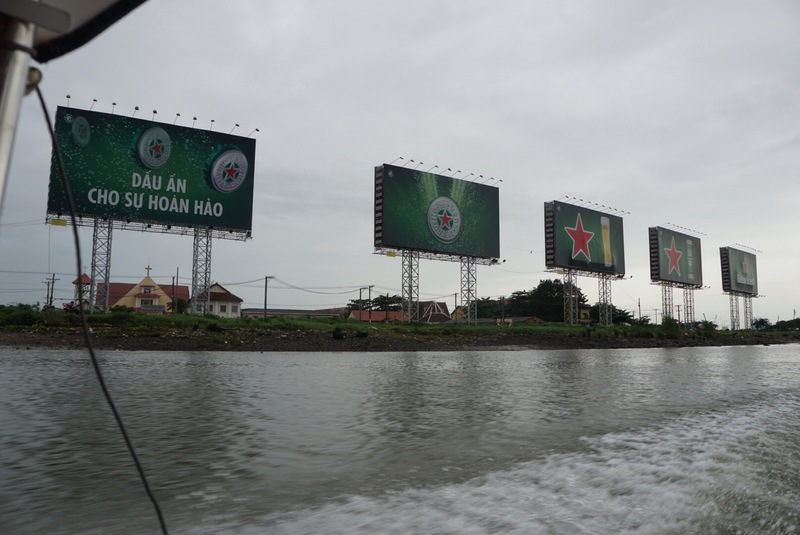 We had a tasty meal at a local house, then back to Saigon and past the huge Heineken billboards that frame the riverside. Our next day was probably the first overall worst day of the trip. Everyone was crankly, snappish. I’ll just relay how dinner went as an example. I wanted to find a place for bun chay, or vegetarian noodle salad, and found one that didn’t seem too far but not quite walkable. We managed to get a taxi and when he let us out…we had left all the cash back at the apartment. Eric and the kids got out and walked to the restaurant and I stayed with the driver to get cash. By the time the driver found a working ATM and I paid him, it was nearly double the fare! He dropped me off where he had left the rest of my family, but they were nowhere to be seen. I didn’t realize it, but the restaurant was in the backpacker district. Loud, bright lights, tons of people vying for your attention and asking if you want a massage. I later learned that Eric was offered some “fine ladies” a few times when the kids were a few steps behind. No one I asked knew where the restaurant was. I had to stop in at a hotel and ask them to google it. I got there and found my family waiting for me, and I was annoyed they hadn’t waited at the spot to go together. And then the food wasn’t that great! Ugh. We tried to make up for it by having a beverage at a rooftop bar but the boys just whined about how it was too high up for them and how they felt vertiginous and spent the time looking away from the edge. It was ladies’ night at the bar, so I thought things might be looking up, but then they handed me a free drink of…a strawberry daquiri, possibly one of the worst alcoholic cocktails known to woman. So the day ended, and I suppose one bad day out of the last six weeks isn’t bad, but I could have done without the insult of a strawberry daquiri. In which we say gooooodbye, Vietnam! I don’t know if I’ll ever be able to hug you again Sujata after seeing that thing around your neck!!! Oh – I agree a Strawberry Daquiri – how awful!!! Still, one bad day in an amazing week and all the changes you managed – nice work! Oh – and a shout out about Eric’s post – and you doing all the planning and arranging. You are a saint.